In his latest solo work, El border brujo draws from Guillermo’s 30 year old living archive and combines new and classic performance material to present a unique perspective on the immediate future of the Americas. His-self styled “imaginary activism” invokes performance art as a form of radical democracy and citizenship. Combining spoken word poetry, activist theory, radical storytelling and language experimentation, Gómez-Peña offers critical and humorous commentary about the art world, academia, new technologies, the culture of war and violence in the US, organized crime in Mexico, gender and race politics, and the latest wave of complications surrounding gentrification in the “creative city”. This spoken word performance includes cameos by troupe members Balitronica and Saula. Besides his international work with the legendary troupe La Pocha Nostra, he has presented his solo work at museums, universities, galleries and theatres throughout the US, Canada, Europe, Latin America, Australia and South Africa. Gómez-Peña’s unique format reveals to an audience the process of creating, languaging and performing material and this process becomes the actual project. It is precisely in his new solo work where Gómez-Peña’s literature, theory, activism, pedagogy & live art come together in a wonderfully strange mix. Gómez-Peña has spent many years developing his unique solo style, “a combination of embodied poetry, performance activism and theatricalizations of postcolonial theory.” In his ten books, as in his live performances, digital art, videos and photo-performances, he pushes the boundaries still further, exploring what’s left for artists to do in a repressive global culture of censorship, paranoid nationalism and what he terms “the mainstream bizarre.” Gómez-Peña examines where this leaves the critical practice of artists who aim to make tactical, performative interventions into our notions of culture, race and sexuality. Most recently he has also been exploring the poetic and activist use of new technologies and social media. 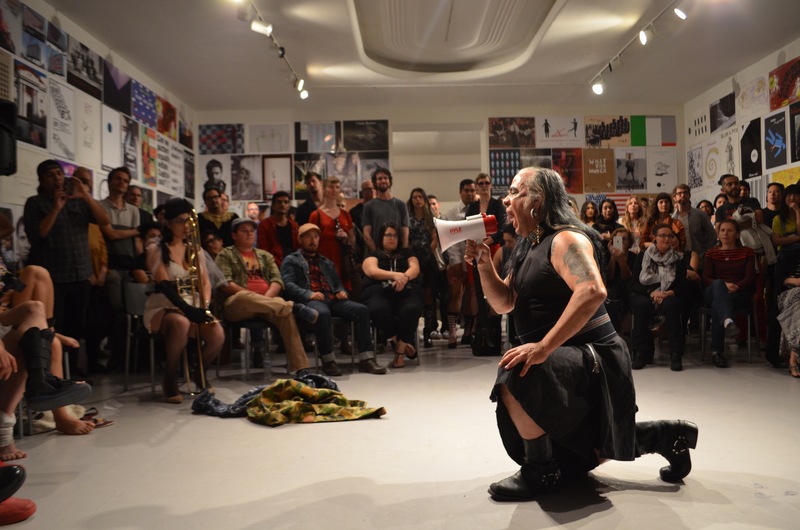 Guillermo Gómez-Peña (US/Mexico) is a performance artist, writer, activist, radical pedagogue and director of the performance troupe La Pocha Nostra. Born in Mexico City, he moved to the US in 1978. His performance work and 11 books have contributed to the debates on cultural & gender diversity, border culture and US/Mexico relations. His artwork has been presented at over nine hundred venues across the US, Canada, Latin America, Europe, Russia, South Africa and Australia. A MacArthur Fellow, Bessie and American Book Award winner, he is a regular contributor for newspapers and magazines in the US, Mexico, and Europe and a contributing editor to The Drama Review (NYU/MIT) and the Live Art Almanac (Live Art Development Agency-UK). Gómez-Peña is a Senior Fellow in the Hemispheric Institute of Performance and Politics, a Patron for the London-based Live Art Development Agency, was named Samuel Hoi Fellow by USA Artists in 2012 and received a Eureka Fellowship from the Fleishhacker Foundation in 2013. Read a review of Guillermo Gómez-Peña: The Most (Un) Documented Mexican Artist in Hyperallergic.